We are delighted to announce the promotion of Lauri Engel to the position of Senior Vice President, Chief Operating Officer for KDI Elements. 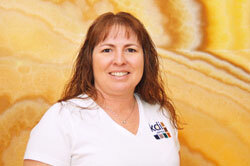 Lauri joined KDI over ten years ago as the first employee when there were only 22 total employees. Lauri has performed all duties in the company and has a vast knowledge of all aspects of KDI Elements operations. In this new position, Lauri will have oversight of all departments in the company, including tile, slab & carpet operations, sales, purchasing, accounting, human resources and customer service in both the desert and the pacific headquarters in Hawaii.